FM07, the newest member of the FM line of rugged vehicle-mount computers makes its debut. 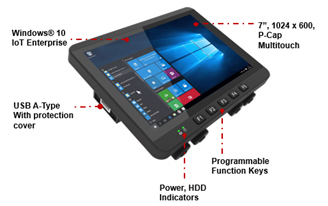 This brand new 7-inch device brings a compact design to a leading class of vehicle-mount computers without making any compromises. It contains an Intel Celeron Apollo Lake processor and P-Cap multi-touch screen for powerful computing in an easy-to-use package. FM07 will make its public appearance at Computex 2018 Booth M1004. The FM07 is suited for a variety of industrial applications, from warehouse management, transportation logistics, airport ground handling operations to heavy-duty vehicle usage. The FM07 has been designed to be especially rugged. 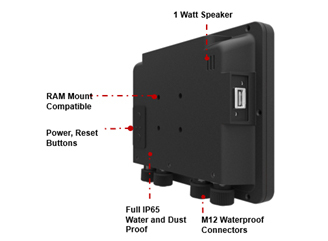 It has full IP65 protection from water and dust and with the addition of M12 connectors, the FM07 can operate in any environment without worry. In addition, compliance with military standard MIL-STD-810G ensures that FM07 will remain functional on any vehicle no matter the condition. By having an operating temperature range of -20°C to 60°C, the device can handle almost any weather condition; from operating on a forklift in a sweltering warehouse, to operating on an airport baggage tug in the icy conditions, FM07 can handle it all. This newest model complements the rest of our FM line of vehicle-mount computers with its small form factor. For those that are seeking options that includes a keypad, the FM08 is a great alternative and if a full-sized screen is needed, the FM10 is also available.